This certainly has been an interesting presidential election experience…for all of us. Unfortunately, it has also been an incredibly divisive and disempowering to the American people. Did you give away your power? Have you been paying attention to the campaign? If so, have you been noticing more negativity in your life recently? Are you feeling angrier or more stressed? Are you more skeptical and judgmental of people you don’t even know? Are you fearful about the possible outcome of the presidential election? Are you more worried about your future? Are you feeling hopeless and like things are out of control? 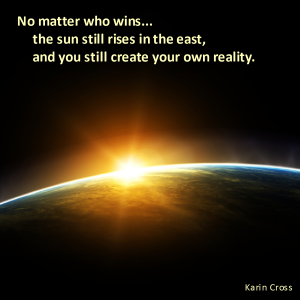 The fact is, however, no matter who wins the presidential election, you and only you STILL create your own reality. Whether it is the best of times or the worst of times, there are always people who thrive and people who struggle, and the difference is only a matter of their thoughts. No matter who wins or what they do, if you are generally positive and hopeful about your life and your future, you will adapt easily to changes and find that they either benefit you or they have no impact on you at all. Your positive mindset and expectations make it so. If you are generally negative and fearful about your life and your future, you will experience struggle and difficulty regardless of who is in the White House. The President is not the source of your happiness or well-being. Nor is anyone else. You are. 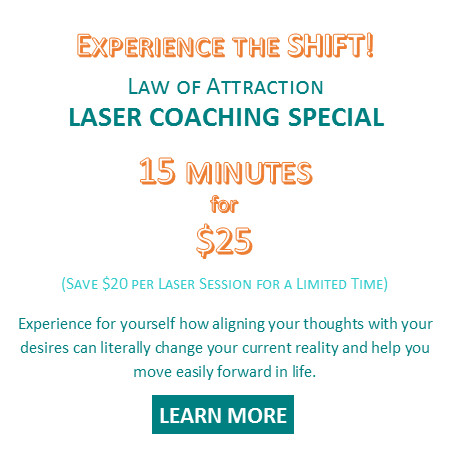 In spite of the negativity of the presidential campaign, we can use it to strengthen our trust and knowing that our well-being is in our own hands…We are in control of our own lives, and we create our own realities. And just as important, we can use it to help us envision and create leadership we trust and a government that effectively, efficiently and nicely represents, supports and empowers its people.